THE NORTH POLE — Earlier today, the Happy Holidays faction in the War on Christmas launched a surprise attack on the North Pole headquarters of the Merry Christmas faction. Heavy damage was done to Merry Christmas H.Q. by the Happy Holidays strike force, which breached the walls and forced its captives to play with dreidels, sit around a Festivus Pole and perform both the Airing of Grievances and the Feats of Strength, and wear Happy New Year hats and blow on similarly marked noisemakers. “Christmas Marshal Santa Claus was at the elf right-to-work toy sweatshop making sure production quotas were being met when Happy Holidays extremists attacked our headquarters. He is unharmed and has been relocated to an undisclosed location,” stated North Pole Sky Marshal Piper Brandypudding — an elf sitting on a flying moose. An unidentified member of the press was ignored by Brandypudding when she asked him if the numerous rumors about Mrs. Claus being kidnapped by the Happy Holidays attack force were true. “We are launching a counter-attack as I speak. Our sleighs will be targeting various Starbucks locations. And Merry Christmas,” emphasized Brandypudding, who then flew away on his moose. 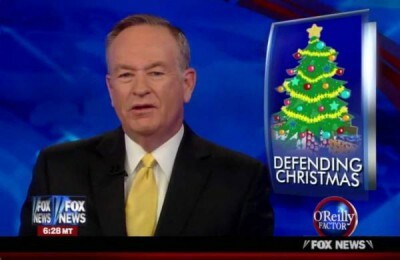 Fox News’ Bill O’Reilly announced he will cover the North Pole attack from Quebec, and yelled about the escalating proxy war between the two factions. Meanwhile, the Happy Holidays faction declared there would be future attacks to force the Merry Christmas faction acknowledge there are many holidays during this time of year.